Have you been searching for the best dip belt? These weighted dip belts are designed to fit around the waist and hold weights of all types while you do pull-ups and other resistance exercises. You’ll find that as you use a weight lifting belt with chain, you’ll gain muscle mass much more quickly. The best dip belts on the market are made of various materials – some nylon, others neoprene or leather – but they all have a few things in common. They are adjustable, and they come with a weight chain. Rather than searching the internet for a weight lifting belt on your own, we’ve compiled a list of the ten best dip belts on the market. Here they are in no particular order. 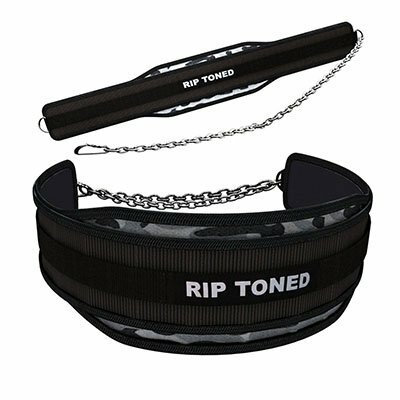 The Rip Toned Dip Belt one of the best dip belts because it comes with a longer chain. This makes it quite versatile. This weight lifting belt for dips and pull ups is designed for men and women, and it can handle any number of exercises. The Rip Toned Dip Belt is currently the only one on the market that has been endorsed by Kevin Weiss, the 2014 World Champion Powerlifter. 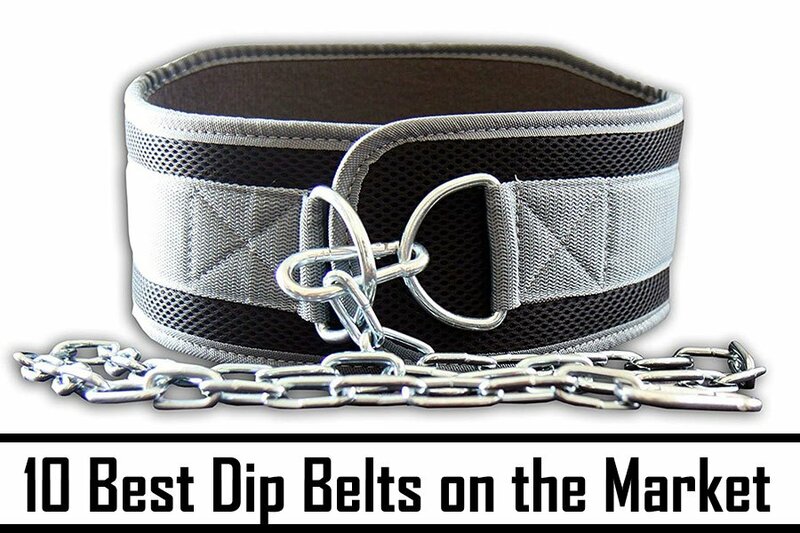 For that reason alone, this weighted dip belt belongs on the list of the best dip belts. However, there are other excellent features as well. They include a 34-inch chain and a very high-quality carabiner. This weight lifting belt is also contoured for a comfortable fit, and hs reinforced stitching throughout. Overall, this weight belt with chain weighs two pounds and measures 13.8 inches by 7.9 inches by 2.4 inches. It comes in four different colors: black, gray, gray camouflage, and red. It can support over 200 pounds of weight and is easily adjusted to fit different sized waists. 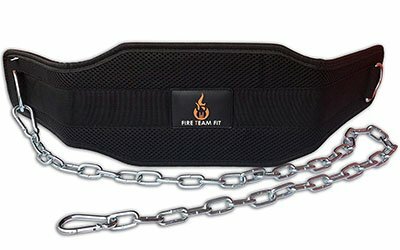 The Fire Team Fit Weight Belt With Chain is on the list of best dip belts because it comes in several sizes, ensuring that you’ll be able to find one the fits properly. This weighted dip belt has a 300-pound weight limit and is made of neoprene fabric. This weight belt with chain is designed to be both strong and durable, which is why it’s on the list of the best dip belts. You’ll find that every element of it, from the stitching to the carabiner, is quite heavy duty. The belt itself is made from neoprene, which makes it much more comfortable than the standard nylon weight belt for dips and pull ups. It comes in two sizes – one for waists that are more than 40 inches in diameter, and one for those that are smaller. The Fire Team Fit Weight Belt comes in two different colors – black and gray – and both have the catchy Fire Team logo on the back. Overall, this weighted dip belt weights a mere 1.3 pounds. The DMoose Fitness Premium Dip Belt With Chain is on the list of the best dip belts because of its colorful exterior. It will make you feel as powerful as superhero as you lift with this red, white, and blue spangled belt. If that color combination doesn’t work for you in a weighted dip belt, rest assured that you have your choice of the belt in blue, black, gray, blue camouflage, and gray camouflage. 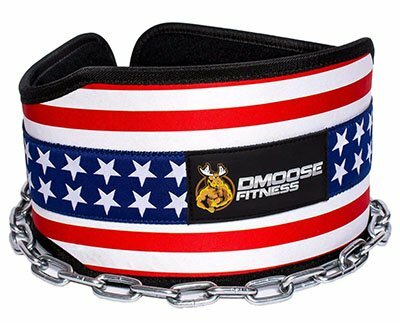 The DMoose Fitness Premium Dip Belt With Chain is a weight belt with chain that advertises itself as one of the best on the market. It’s made from neoprene and has a contoured back to provide plenty of comfort. On top of this, the belt won’t absorb odors, and it contains no lead or PVCs. The chain itself is made from heavy-duty steel, and it measures 34 inches long. Overall, this weight belt with chain measures 29 inches by two inches by six inches. It can handle up to 225 pounds. This belt deserves a spot on the list of best dip belts because it’s extremely versatile and comes in a number of different sizes. 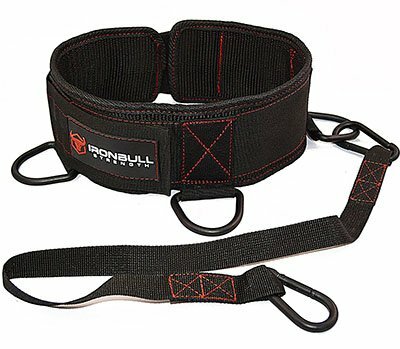 The Iron Bull Strength Advanced Dip Belt is a weight lifting belt with chain that is made of nylon and comes in one color combination – black with red stitching. The nylon construction makes the Iron Bull Strength Advanced Dip Belt is one of the best dip belts because you have your choice of sizes, ranging from small to double extra large. Unlike other weight lifting belts with chains, the “chain” on this belt is made from nylon, not metal. This makes it more flexible and comfortable, ensuring that the belt doesn’t interfere with your workouts. This belt – one of the best dip belts on the market – is different from the others because it’s made of leather. Because of that, this weight lifting belt is much stronger. The material also makes it more comfortable. The Force of Habit Leather Dip Belt is designed to be one size fits all. Since the belt measures 32.25 inches long and 7.75 inches wide, you’ll find that this weight lifting belt with chain is somewhat uncomfortable for people who have smaller waists. However, if you can deal with that, you’ll find that this belt is designed to be both strong and sturdy. It comes with a 30-inch long chain that’s ¼ of an inch thick. 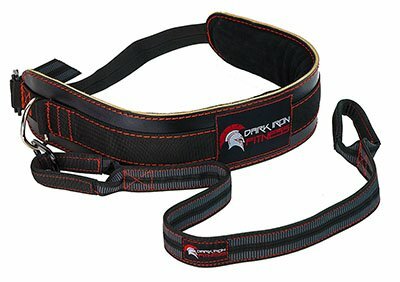 The Dark Iron Fitness Leather Dip Belt is one of the best dip belts because it looks sleek and dangerous. 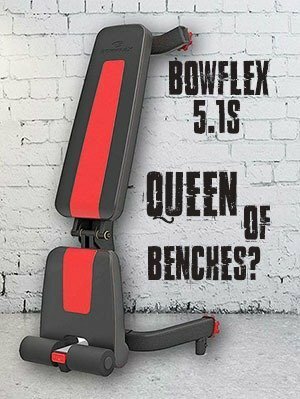 Use this belt, and you’ll be the one person in the gym that everyone is in awe of – even if you’re new to using weight lifting belts. This weight belt with chain is designed to hold up to 270 pounds. It has a weight strap that’s 40 inches long and made of sturdy nylon (although the remainder of the belt consists of leather) that can hold up to six Olympic plates. The belt itself has padding, making it extra comfortable to wear. You won’t have to worry about it digging painfully into your sides while you lift. On top of this, Dark Iron Fitness Leather Dip belt, a weight belt for dips and pull ups, comes in a classic black and red combination. It even has a lifetime warranty! The Brute Belt Nylon Dip Belt made the list of the best dip belts because it lacks all of the bells and whistles. Sometimes the best weighted dip belts appear and are quite simple because they don’t need all of those fancy features. They work just fine without them. 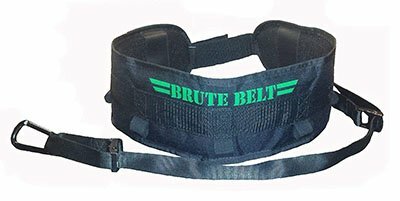 The Brute Belt Nylon Dip Belt is one of them. 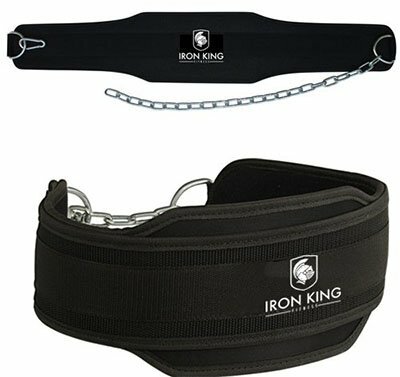 This weight lifting belt is more than just a weight lifting belt with chain. It also has eight different slots built into the belt that can hold weights of all types. This adds to its functionality and is why it’s in the running for best dip belt. The Brute Belt is constructed of military grade materials, and it shows in its camouflage exterior. It’s made entirely of sturdy nylon and can hold up to 270 pounds worth of weight. 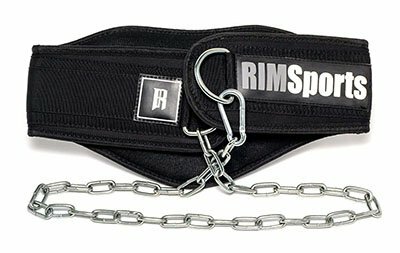 The RIMSports Premium Lifting Belt With Chain is on the list of the best dip belts because it’s made of cotton, a very comfortable, yet strong material. This belt comes in two different color combinations: black and camouflage, and has an attached metal dip belt. This weight belt with chain is very heavy duty, thanks to its reinforced stitching. The wide back was designed purposely to prevent it from digging into your body while lifting weights and doing other maneuvers. The 38-inch chain and steel carabiners make it easy to use, while the adjustable body of the belt ensures that you get the fit that you need. This weight belt for dips and pull ups will help you get through your workouts. The SPUD Inc Dip Belt belongs on the list of the best dip belts because of its unique design. The back is wider and reinforced, while the sides are skinnier, leading up to the chain. This makes the weight belt for dips and pull ups very comfortable to wear and lift in. This weighted dip belt has a back pad that measures ten inches by six inches. The entire belt (except for the chain) is made of webbing, which is very sturdy. The belt comes only in black and has the SPUD Inc logo on the back. It weighs three pounds on its own but can handle over 200 pounds worth of weights. The Iron King Fitness Professional Dip Belt is on the list of the best dip belts because it lives up to its name. This weight belt with chain is double padded and has double stitching, ensuring that it will do the job without digging into your sides in an uncomfortable manner. Overall, this weighted dip belt is designed for professional use, which means that it will work just as well for amateurs who want to gain muscle mass. It works for both men and women and is “one size fits all” ensuring that you’ll be able to use it as long as your waist isn’t overly large.